I am one of those wonderful wives who makes foods that she hates because her husband loves them. Nick loves chicken and dumplings. I have never made this because I do not like it. Dumplings are too mushy for me. So I finally sucked it up and made him some of one of his all-time favorite meals. Even though I don't like it, I did eat it. The kids and Nick loved it and raved about it - so you will have to take their word for it. Combine flour, baking powder, and salt. Cut in butter. Stir in milk until dough forms. Roll out thinly on a heavily floured surface. Cut into 2x2-inch squares. Meanwhile bring chicken broth to a boil. Drop in squares one by one and cook for 15 to 20 minutes. Add chicken and heat until warm. Yum, we love chicken and dumplings at our house, in fact we have it on our menu this week. I can vouch that this is good, because it's the exact same recipe I use. It's an oldie but a goodie. <3 This is something I have yet to make. However, I really want to make it one day. My mom made it from scratch when I was a kid and I just loved it. 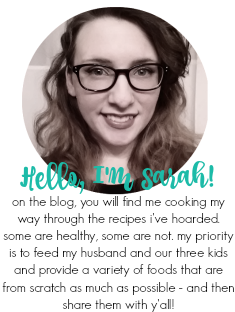 Thanks for sharing, Sarah!